Product prices and availability are accurate as of 2019-04-23 00:27:28 UTC and are subject to change. Any price and availability information displayed on http://www.amazon.com/ at the time of purchase will apply to the purchase of this product. Ben, a sports analytics wizard, loves baseball. Eric, his best friend, hates it. 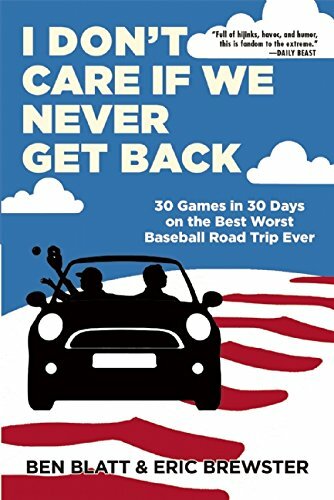 But when Ben writes an algorithm for the optimal baseball road trip—an impossible dream of seeing every pitch of 30 games in 30 stadiums in 30 days—who will he call on to take shifts behind the wheel, especially when those shifts include nineteen hours straight from Phoenix to Kansas City? Eric, of course. Will Eric regret it? Most definitely. On June 1, 2013, Ben and Eric set out to see America through the bleachers and concession stands of America’s favorite pastime. Along the way, human error and Mother Nature throw their mathematically optimized schedule a few curveballs. A mix-up in Denver turns a planned day off in Las Vegas into a twenty-hour drive, and a summer storm of biblical proportions threatens to make the whole thing logistically impossible, if they don’t kill each other first. I Don’t Care If We Never Get Back is a charming, insightful, and hilarious book about the limits of fandom and the limitlessness of friendship.